Cult of Luna has been one of those bands I've loved but never gotten to see; the last time they were in Chicago, I was on a family trip (live alone and have no friends kids; it's the only way). I suppose I should say had been; a few weeks ago, CoL came through Reggie's to play their staggering Mariner album with Julie Christmas. The band was sensational live, everything I'd hoped for, but Christmas was an absolute revelation, a Puciato-level force of nature that elevated the performance far above my wildest expectations. I couldn't have asked for anything more (ok... maybe a "Mute Departure" encore) from the set. 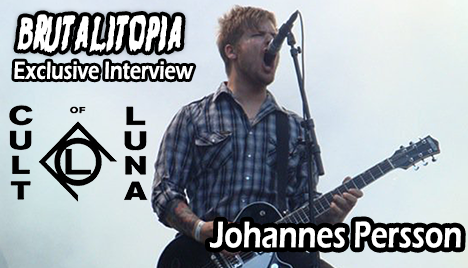 Before the show even started though, I was living the high life, as I got to sit down with CoL's lead singer/guitarist Johannes Persson to talk about the band, Mariner, touring, collaborating, and a slew of other topics! This was one of the coolest interviews I've had, so check it out after the break!